It’s Super Bowl Sunday, and I’m waiting for the game with hours to kill. 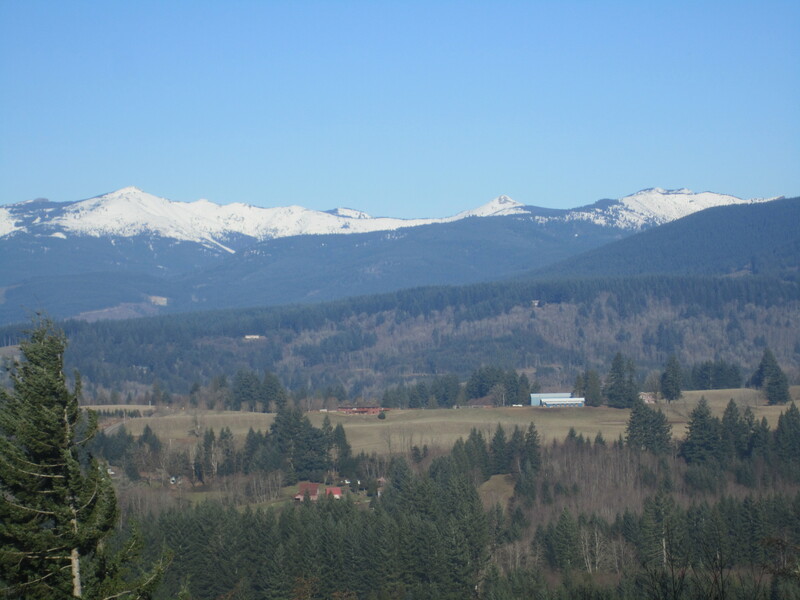 The weather is spectacular for February in Cascadia. Must be time for a hike! I have been fairly lazy about getting my hiking fixes lately, focusing more on other writing and creative endeavors (follow me on Instagram) but I was happy to hit Forest Park today with my canine pal, Jackie Chan. The parking areas on Germantown Road were packed, which is normal on a weekend, especially when the weather is nice. I parked on the shoulder and headed down a nearby fire lane. People flock to the Wildwood Trail, but there is a lot more solitude on most Fire Lanes in Forest Park. Fire Lane 10 dives down the side of a canyon, crossing a nice little creek. Everything is green, which is more spectacular when the mossy edge of a tree limb are backlit. Beyond the creek, there is some work to do. 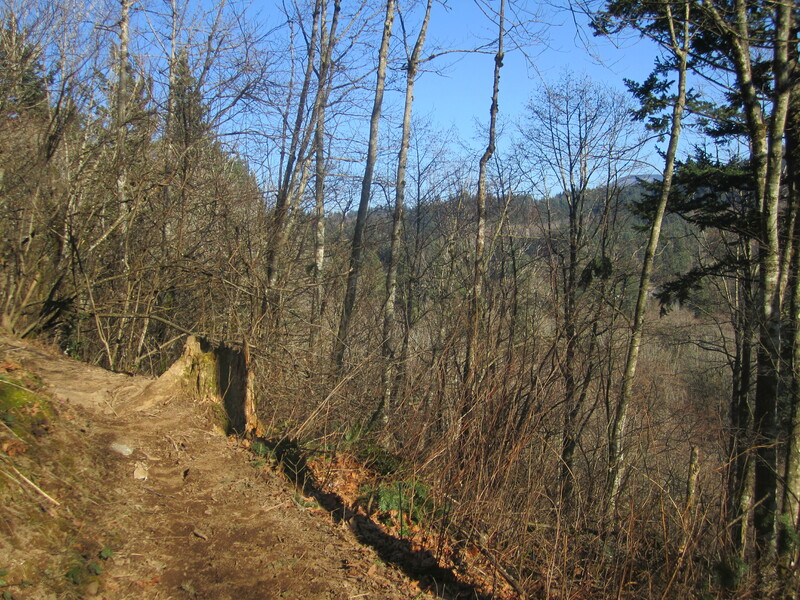 The fire lane climbs to the Linnton Trail, where I started seeing other hikers or runners. 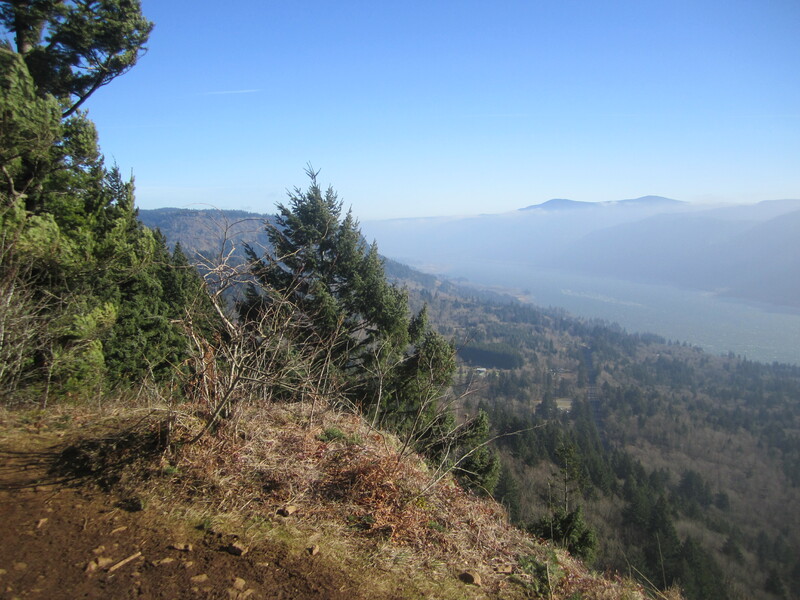 The Linnton Trial is not too steep, but it’s all uphill for about a mile until it meets the Wildwood Trail. From there I could meander back towards Germantown Road and my car. Now I’m ready for the game. Go Broncos! 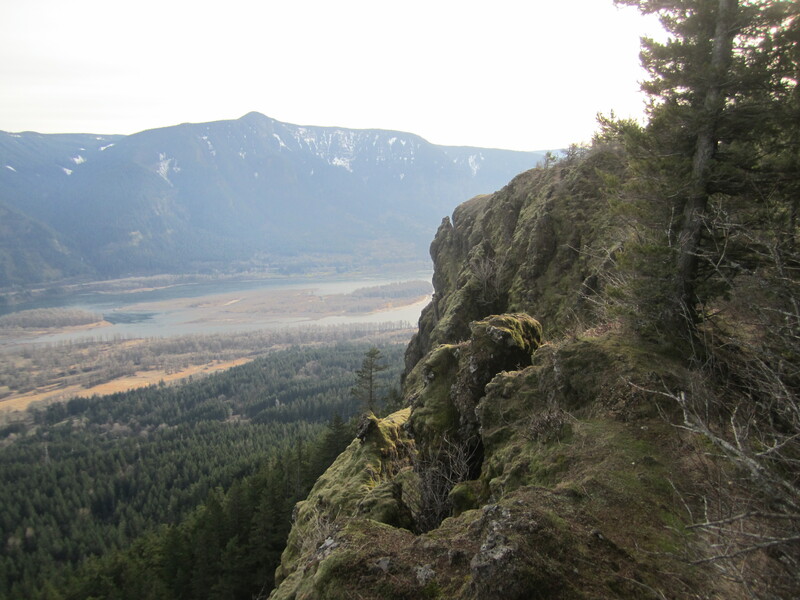 On Sunday, I returned to my old stomping grounds at the foot of Mt. Hood with bittersweet feelings. First, I attended a celebration of life for a long time community volunteer and fine man. I was able to visit many of my former fire department brethren. Then it was time to go. I had no plan, but wanted a walk in the woods knowing there would be snow nearby. Less than two miles up Lolo Pass road, snow was starting to pile up on the side of the road. Hmm. Could be interesting, I thought, especially without four wheel drive. 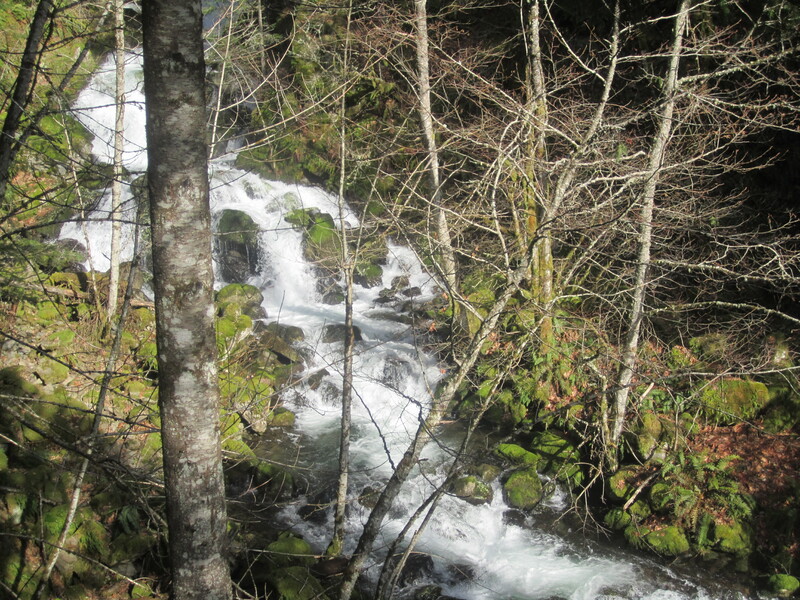 I pieced a pullout near the Sandy River and tromped through the woods. There was no goal but to get in touch with nature. It felt good. Just what I needed. Significant snowfall can make an adventure out of any neighborhood walk. So it was this afternoon in the Rose City. I loved seeing the Olympic Rings in the snow nearby. Jackie liked it too. We’re not as excited about the freezing rain that is coming…. Stay warm, everybody. “Baby, it’s cold outside.” Even in Portland. It’s not subzero here like Prineville or Butte, but it’s pretty cold for Cascadia. Getting motivated to go outside is a bit more challenging. A few nights ago, I got a flat tire after dark, as the cold hit. I had the wrong shoes on, my old Converse low tops. Bad idea. Inclement weather makes emergency planning that much more crucial. I plan to get out for a walk today. I’ll be wearing boots and the scarf my almost daughter in law knitted. Tonight it will be below 20, unusual for Portland, so times a wastin’. Stay warm, my friends, and keep moving. 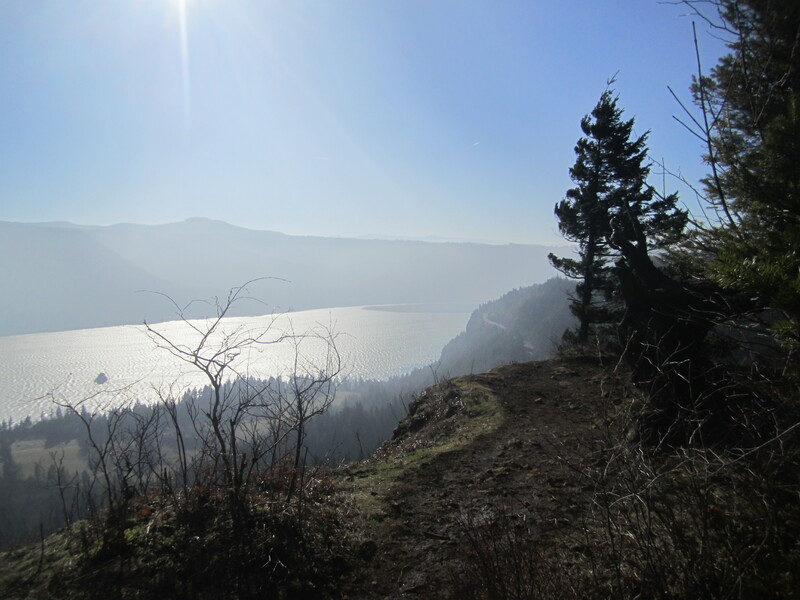 Cape Horn is perched near the western end of the Columbia Gorge on the Washington side, of which I am becoming more enamored. 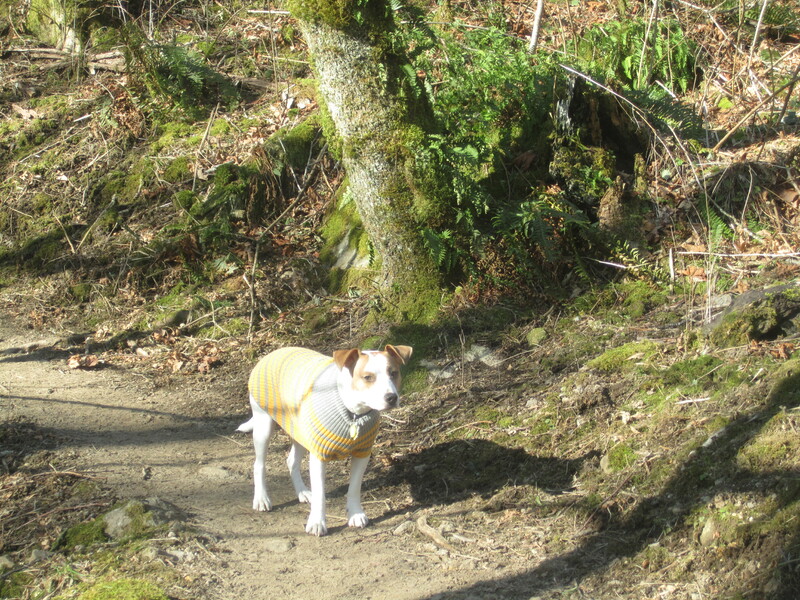 Trail pup Jackie Chan and I drove out there this morning hoping it wouldn’t be too cold. The temp seemed okay, but after I passed Washougal, I could see branches swaying in a strong wind. I knew it would be a factor. Jackie Chan is a black belt with orange sweater. There is well-signed and appointed trailhead just off SR 14. (decent porta-potty on one side and an informative kiosk including a map on the other). 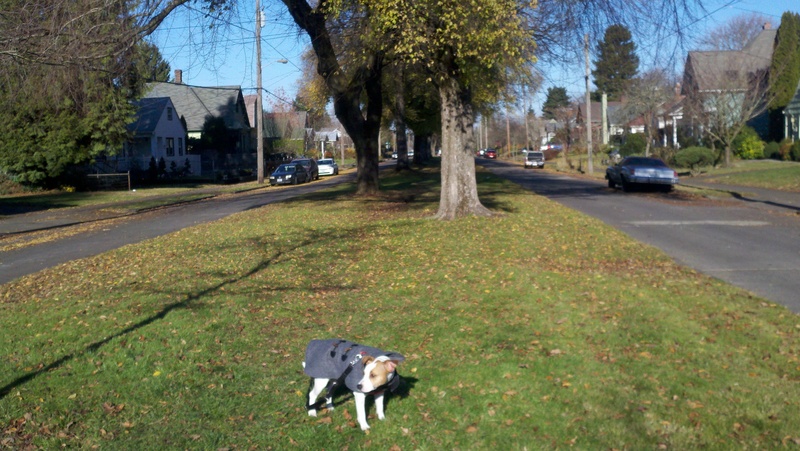 The wind was fairly screaming so I Jackie’s sweater on him (very preppy, I know) on and added a layer myself. I knew up higher the wind chill would be worse. The trail starts casually in a hardwood forest reminiscent of the Appalachians. Strangely, there were no Doug Firs or Western Red Cedars in sight. 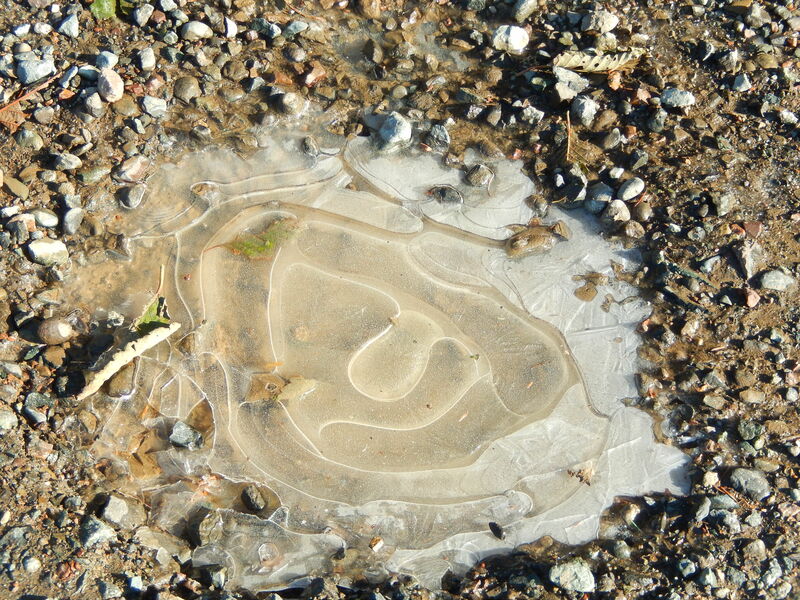 After crossing a tiny creek, the frozen trail began switchbacking gradually up the slope. It was not yet eleven, and the sun created shadows and interesting light effects behind the trees. I saw only one other hiker on the way up. I wondered if I’d be by myself. 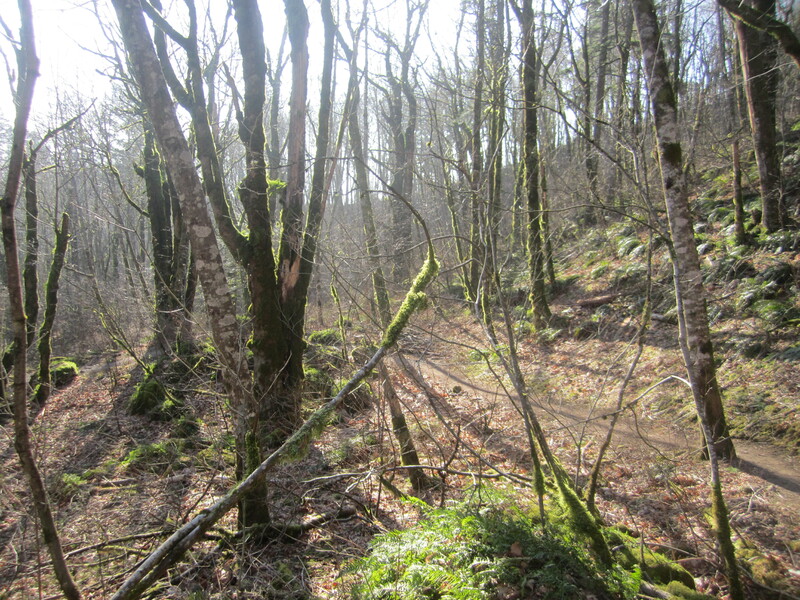 I did not push the pace but enjoyed the intermittent views through the trees. 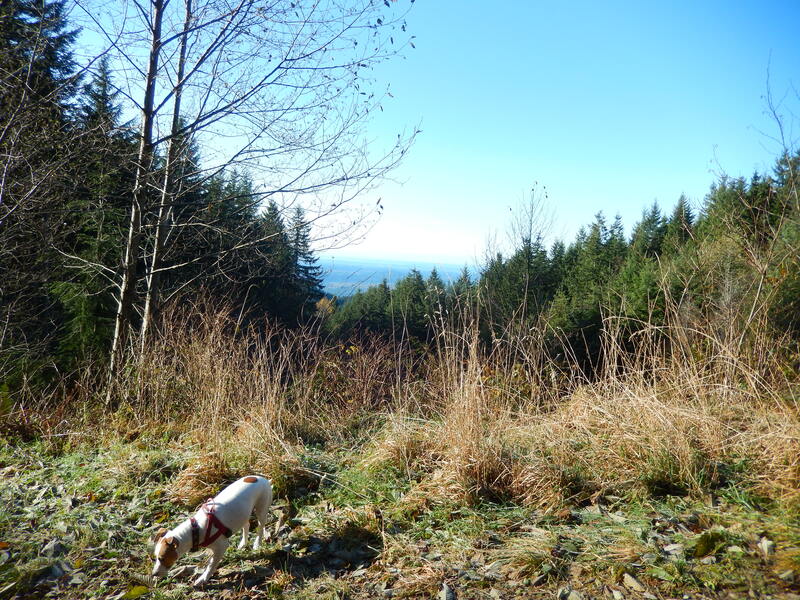 I tried to spy Hamilton Mountain or Larch Mountain, but that would have to wait. Half an hour up, the trail came close to a powerline road, and I ducked into the open for a photo looking toward Silver Star and Baldy, where I’d been last August. 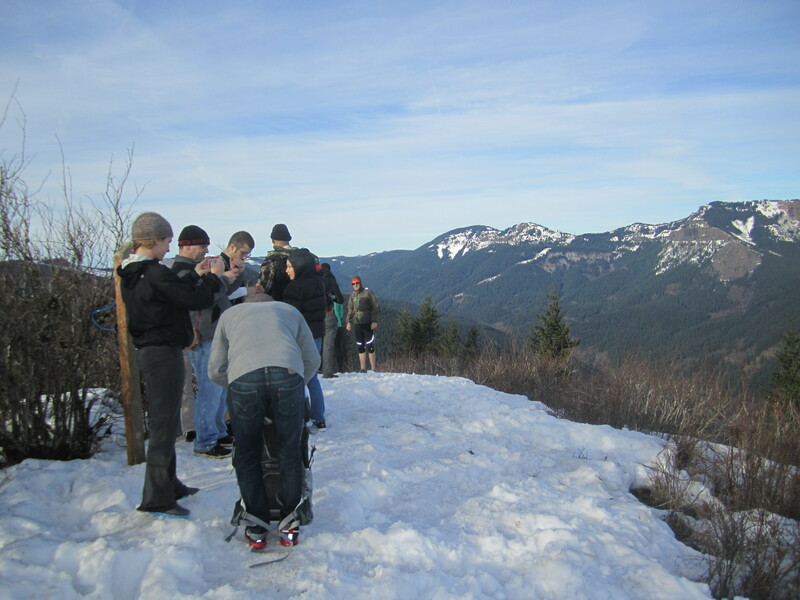 Snow started to appear on the ground in patches, but nothing like my Wind Mountain adventure a few weeks ago. 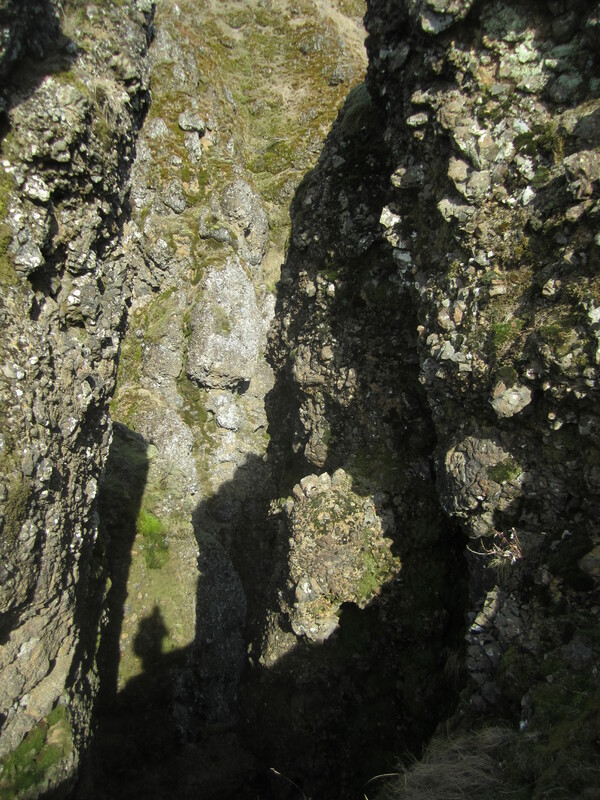 Finally I clambered up to the first couple of viewpoints. The wind was in fine form, probably gusting between twenty five and forty miles per hour and there were a few icy spots. The views from the first clifftop bluff were great, but the windchill was not inviting, so I moved on to a more secluded spot and took a few more photos, worried about Jackie the whole time. He’s very bright, but he doesn’t exactly know what it means to fall down a cliff (Note to self: teach Jackie physics). As I had other tasks to accomplish at home, I opted to head back to the car rather than push on to another viewpoint a mile ahead. That could wait for spring. 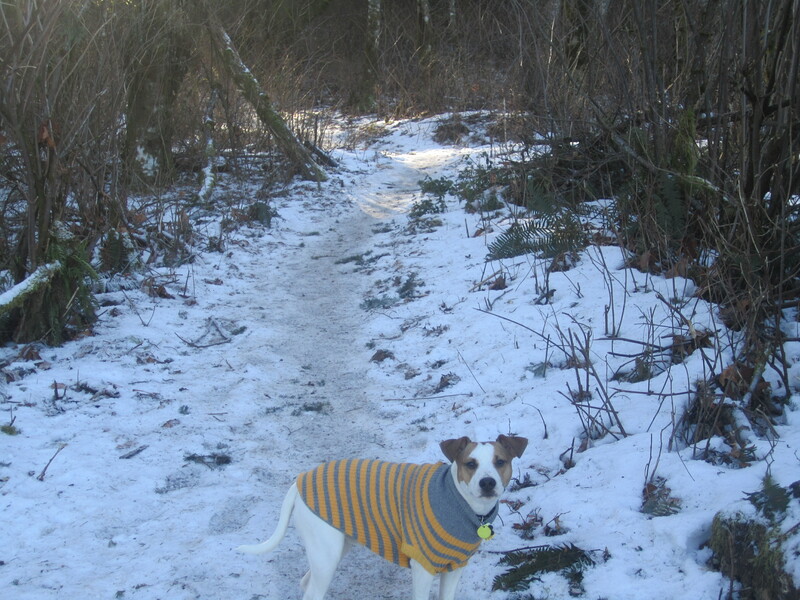 On the shady side of the ridge, there was more snow, and Jackie loved to romp in it. He had been staying by my heels or just in front of me most of the time, but in the snow he got goofy. I wish I could have captured his exuberance, but any time I pulled out the camera, he struck a serious pose. 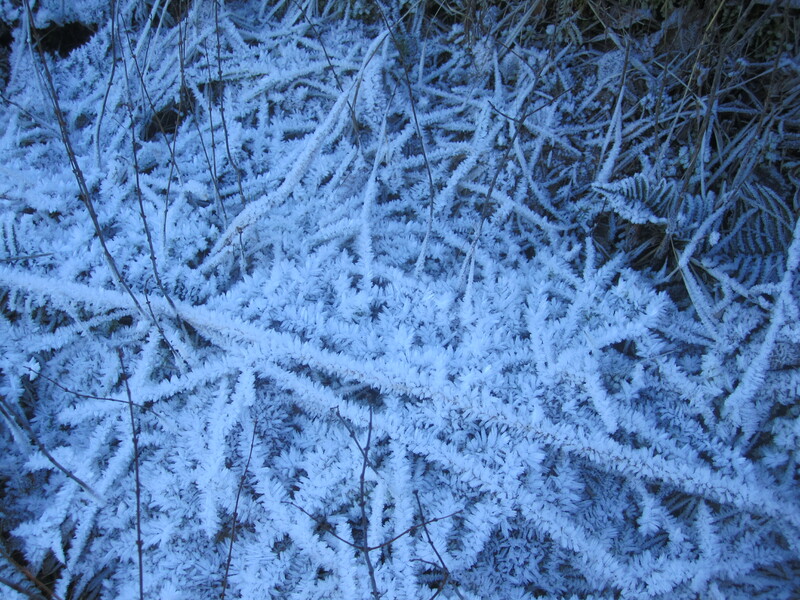 I descended partway by the powerline road, which made a nice shortcut, and there I admired the crystallized snow and frost on plants. 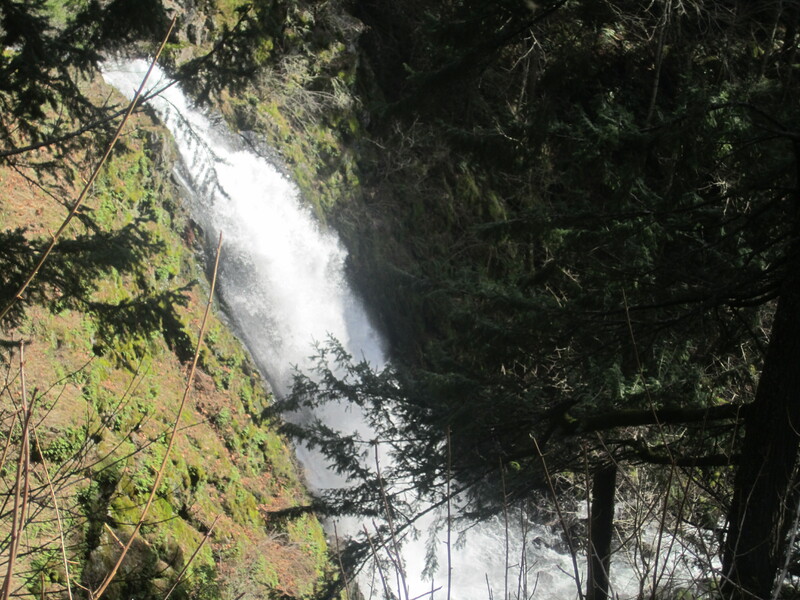 As it neared noon on my descent, I started passing people regularly, bundled up and smiling. Everyone was having a good time. Well, we were smiling, because we’d left the worse of the wind behind. Jackie was tuckered. He napped most of the way home, then tried to lick my face off while we waited for the Interstate Bridge to lower its deck. 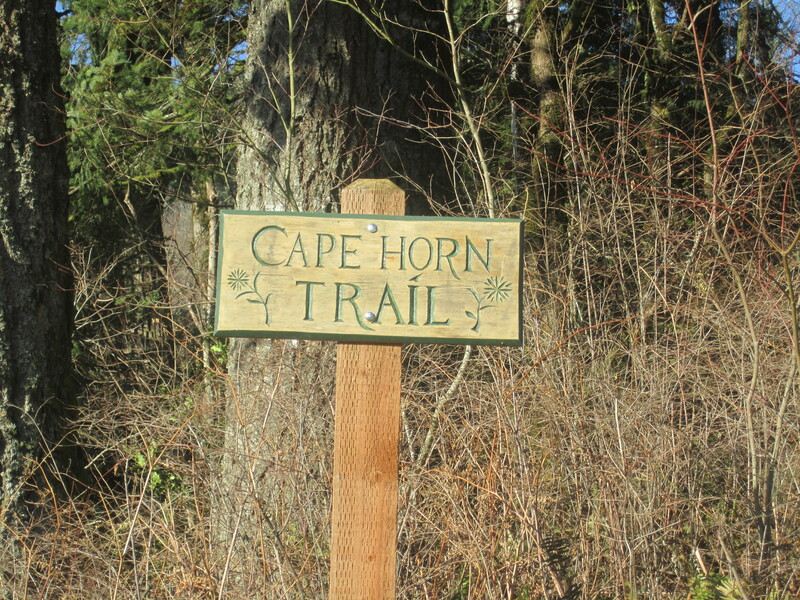 The Cape Horn Trail has a loop, part of which is closed part of the year for peregrine falcon nesting. That is the section below SR 14. 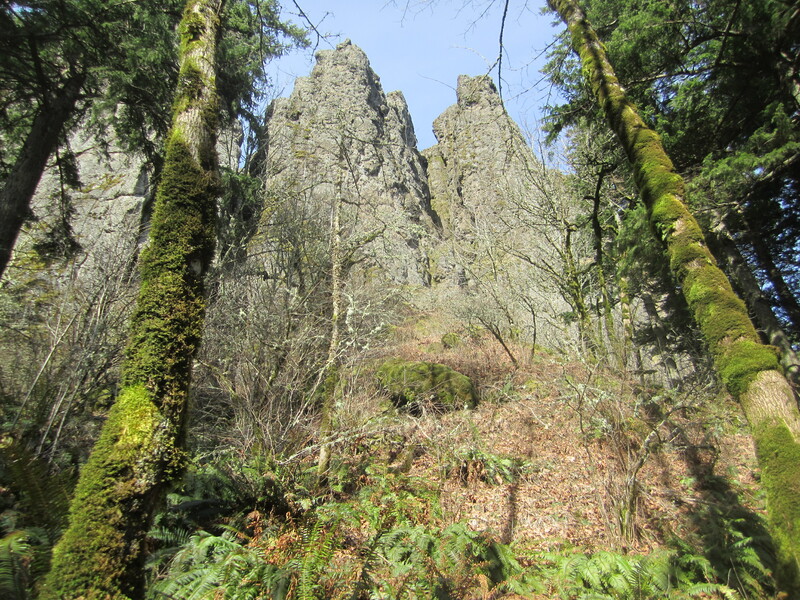 This is the closest significant trail to the Portland area on the Washington side of the Gorge, and it’s easy to find. Those factors alone recommend it for weekend warriors, but it is a lovely spot as well, and the loop possibilities are intriguing. Highly recommended. 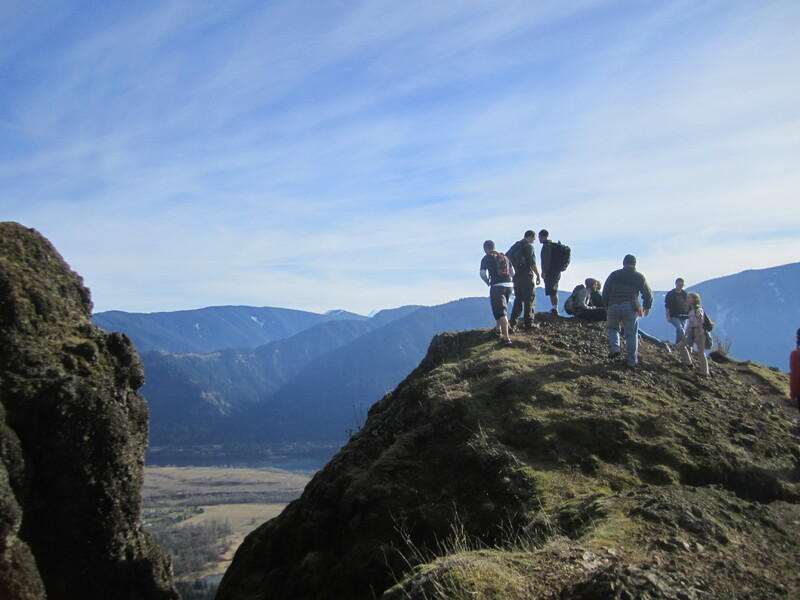 When I saw a sunny day forecast late December, I knew the hiking doldrums were over. It was time to climb! My goal was Dog Mountain, and my partner was my puppy Jackie. Perfect. Except the thermometer reading. As I drove out the Columbia River Gorge, I realized there was more snow than expected. 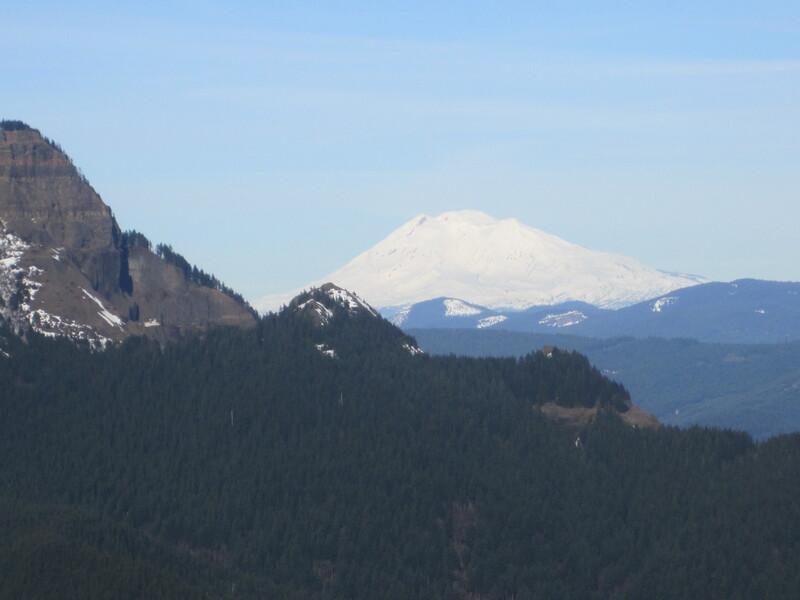 Dog Mountain would have some healthy snow. 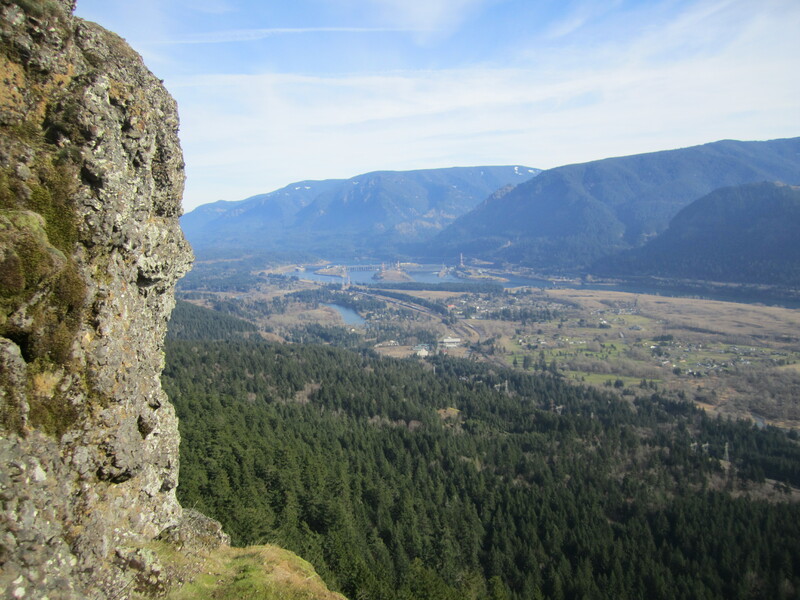 I modified my goal and opted for nearby Wind Mountain, which is just under 2000 feet. 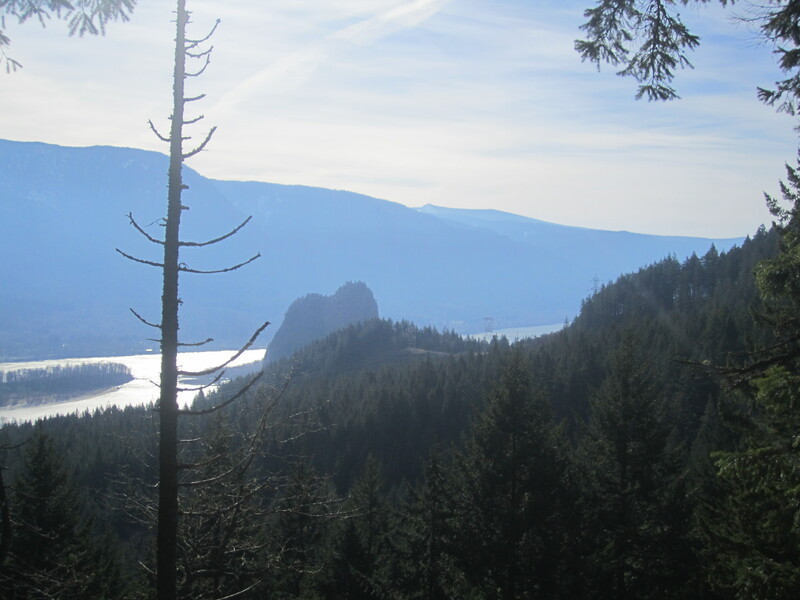 The peak rises straight out of the Columbia River, its conical form obvious from Washington’s Highway 14. I found the trailhead off the aptly-named Wind Mountain Road. A sign pointed up Girl Scout Road, where I found a broad parking area at a saddle crusted in snow and icy puddles. I was intrigued to find a boot scraper at the trailhead to prevent transplantation of invasive species. A sign of things to come, perhaps. 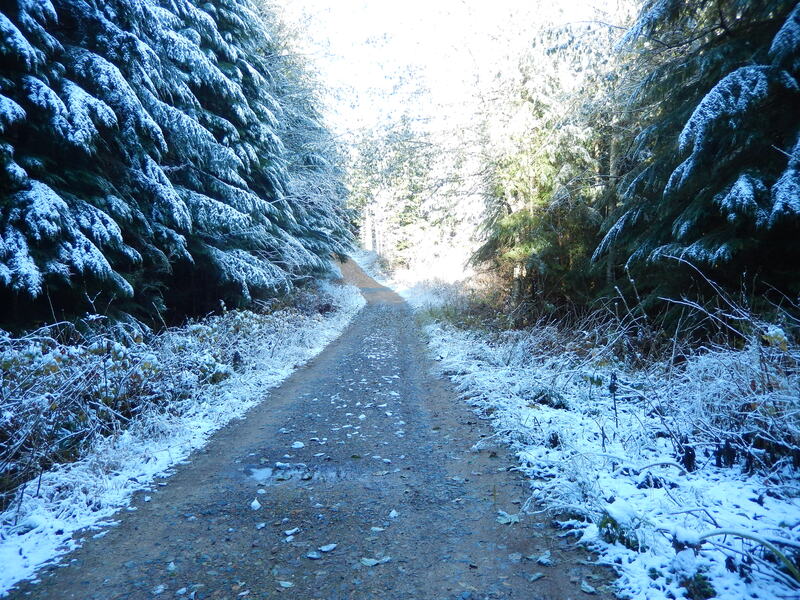 I popped on a beanie before I left the car, and a few minutes up the trail I added gloves. 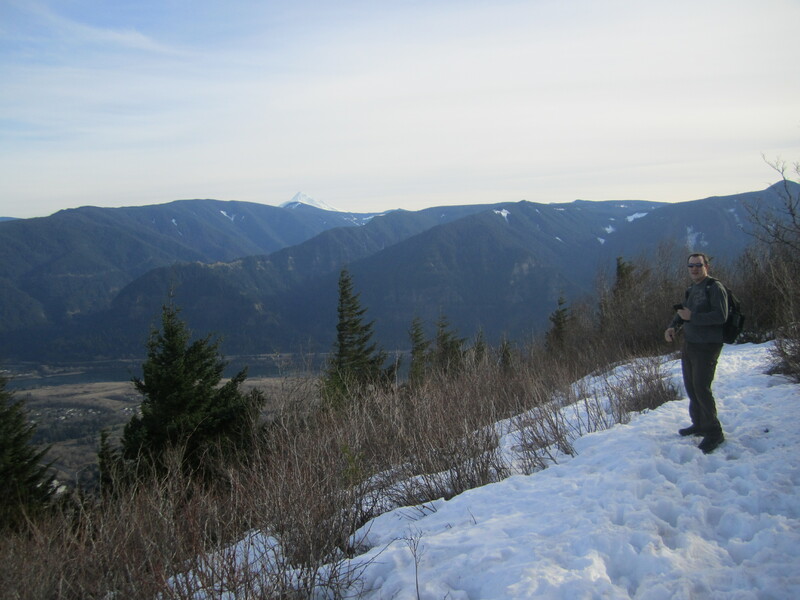 As the trail angled around the eastern flank of the peak, I hit patches of packed snow which made for slick walking. I had to clamber over a number of downed logs, and under at least one, but it was manageable as long as I was careful. I briefly regretted not having boot chains or microspikes. Jackie had no problems thanks to his nails. Naturally, with greater elevation came more snow, but it was drier snow and not as packed out; my boot lugs bit into it nicely. 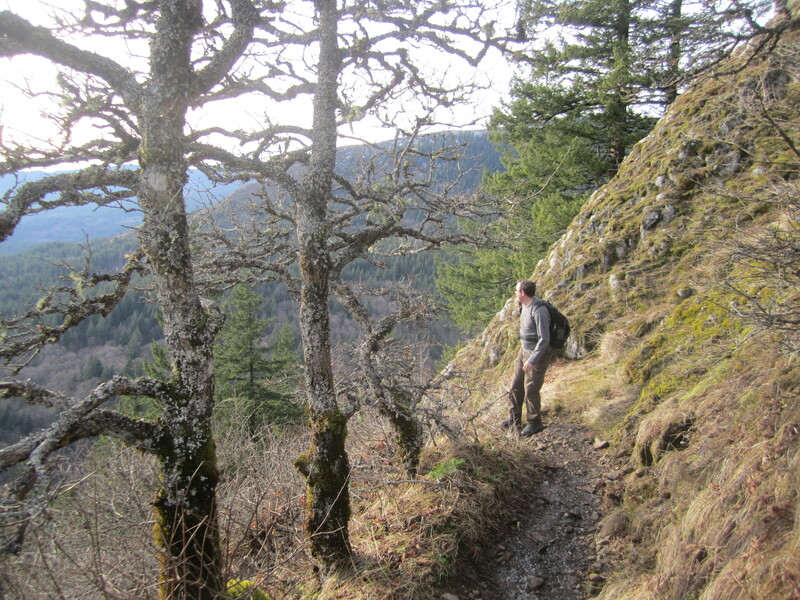 The trail cut back on a ridge and meandered north beneath the summit cone, finally twisting south to the summit. There was a prominent sign about Native American rock work to beware and leave undisturbed. It simply added another facet to the trip and the destination. The views were great in multiple directions. 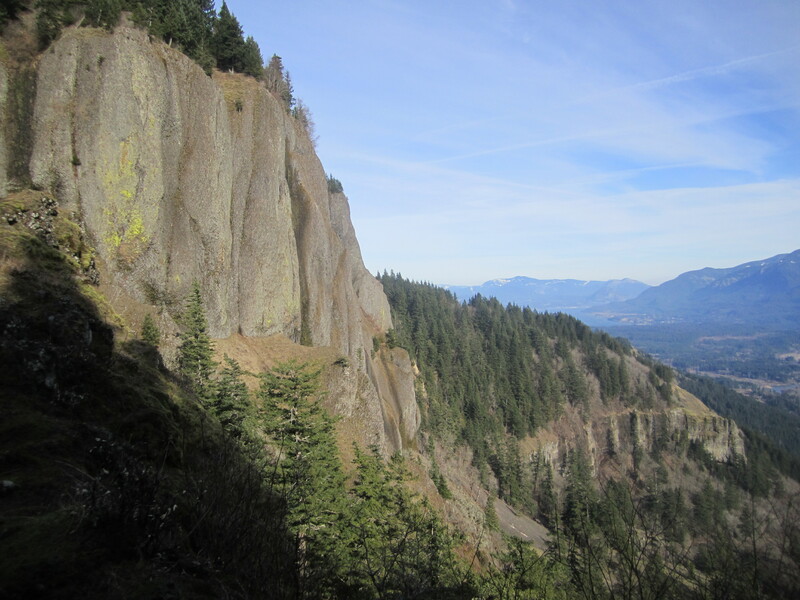 I had to scale a snowy crest to hit the summit proper, then I found a dry spot in some rocks, where I got some water and gaped at the massive southern wall of the gorge, Mount Defiance and its brethren enticing me. To the east, Dog Mountain looked snowy indeed. 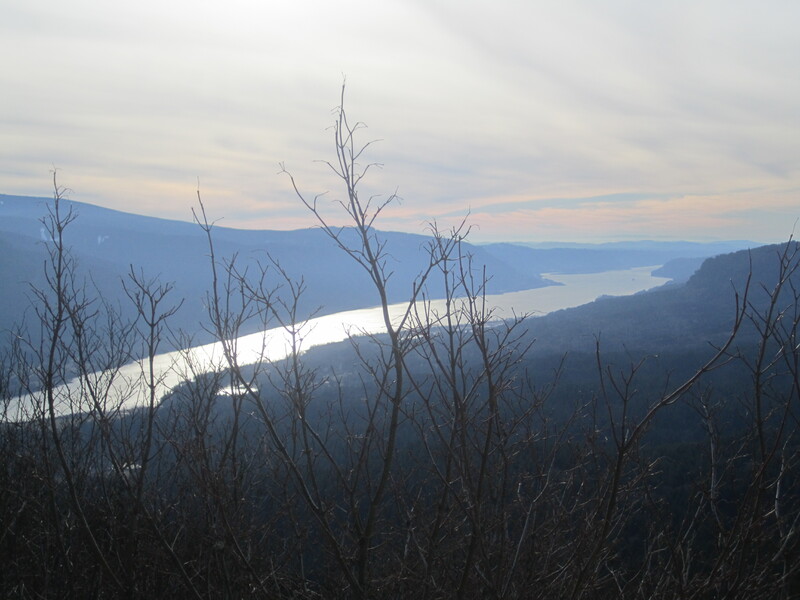 Looking down at the river, snowy tinted mountains rising steeply out of the mighty Columbia before me, I couldn’t help but feel satisfied. Wind Mountain is nobody’s epic summit, but winter definitely made it interesting. The sun warmed me even as a couple vision quest shelters nearby were cloaked in snow. I’d felt wind most of the way up, but on the summit it eased and we were able to relax for a while. What a day. Jackie was a real trooper for only his second real summit. 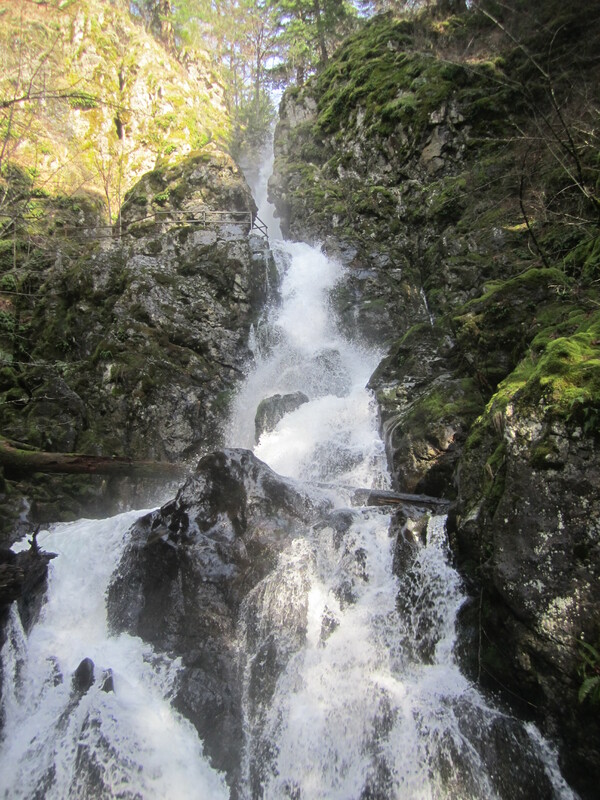 With this great reminder of the wonders in the Gorge, we will definitely have to return in the spring.